Sold! 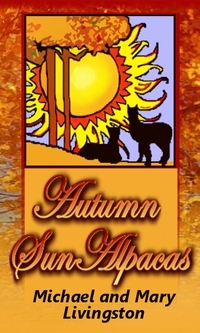 Congratulations to Jason and Corinne Cain of Aurora Australis Alpacas for their purchase of Mystery! Lark is an easy-going, proven dam whose lineage and progeny speaks volumes for her. Your eye catches her quiet grace, free movement, and well-balanced frame decorated by her excellent coverage of black fleece. 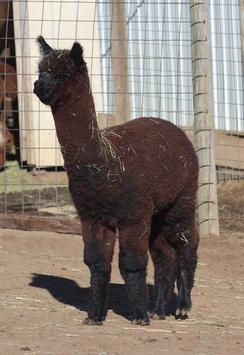 Along with her dark looks and boxy conformation, she offers crimpy fiber with great density, shine and handle to her crias. Lark's first born -- AutumnSun's Canyon Wren -- is a lovely medium brown girl sired by Annual's Bea-2 Bomber, 3X AOA champion & overall 9X champion light rose grey son of the invincible Aussie .38 Special. This vigorous girl has her dam's spot-on conformation and stately beauty adorned with a lovely soft, long and crimpy fleece. Within Lark is a bundle of prepotent grey and black lineages. Her attentive & sweet dam, Mystery, is true black dam with grey genetics. Mystery's dam is Crescent Moon's Raylina, a medium rose grey champion who produces champions. Skyline Alpacas (known for their grey & black program) says of this dam: "Raylina produces what we believe to be the "Premier Seed Stock" that we are striving for...." Mystery's medium silver grey sire, ATV Silver Magnum, is a grey champion son of Mr. Roosevelt as well as the sire of ATV Silver Elation champion, himself a sire of champions. With this parentage, it clear that Lark has the genetics to be an excellent dam in either or both a black and grey program. Wren's genetic bank added to Lark's stacked genetics with that of Annual's Bea-2 Bomber, an exceptional grey male whose own heritage proudly presents the prominent parentage of Aussie .38 Special as his sire and Almost Paradise Farms Beatriz. Aussie .38 special needs no introduction, a multiple champion sire and grandsire of champion alpacas. 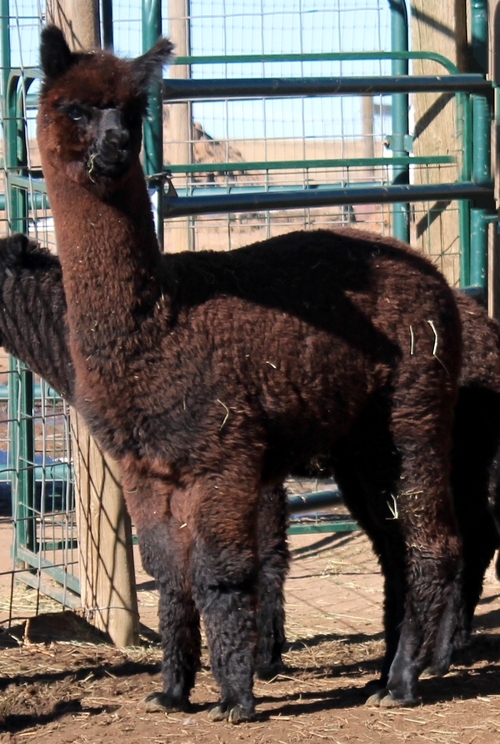 Beatriz, once a cornerstone of Alpacas Annual and now a foundation dam at Patagonia Estates, is well known in the grey community for many champion crias. Las Flores del Altiplano, one of the co-owners of Bomber says of her: "Beatriz, can safely be called an impact dam. All of her progeny have Color Championships. Bea maintains a 24.3 AFD/3.9 SD and 15.9 CV at age 12!!!!" You can see that Wren is the compilation of grey and black genetics from several generations, all generously sprinkled with championship winners -- not the least being her sire and her grandsires. As a crescendo to her symphony, Lark was bred to our true black 13x champion AutumnSun's Black Maelstrom. Maelstrom is a masterpiece of exceptional fiber and physical traits, demonstrated in his accolades in show after show. 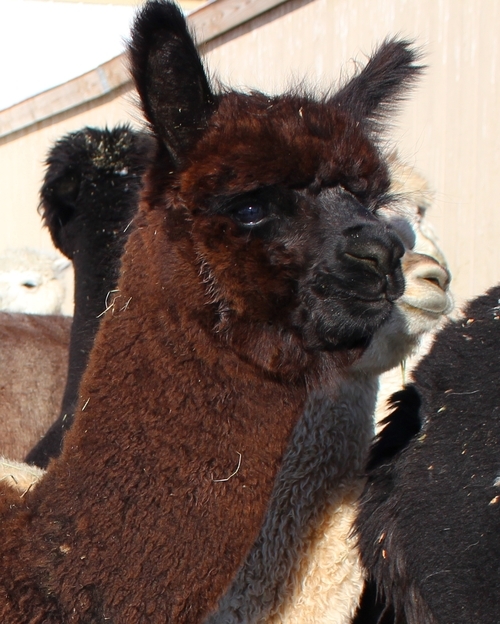 As both the 2016 AOA National Fleece Black Male Color Champion with his yearling fleece and the 2017 AOA National Halter Black Male Color Champion with his 2-year-old fleece, he shows his lasting fiber qualities -- which he brings to the mix of genetics in this breeding. 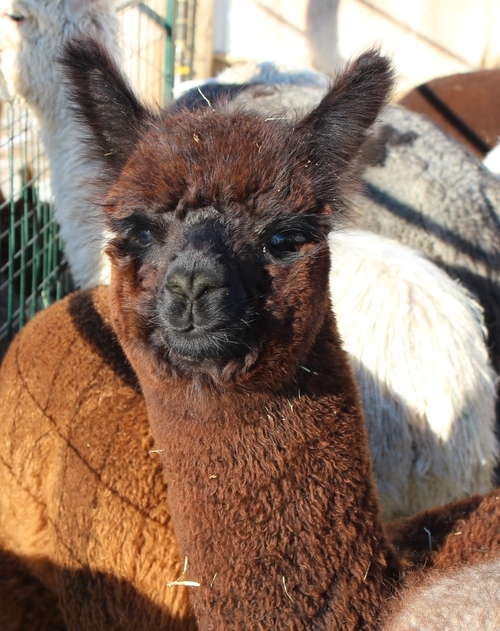 Lark rewarded us with a beautiful black female cria! We are thrilled!